When I arrived in Las Vegas, one of the places that I knew I had to hit up was Hofbräuhaus. I was in amazement when I walked into the “Beer Hall”, it was immense. Hofbräuhaus is Bavarian and serves imported German beer in gigantic liter steins. You could wimp out and get a smaller stein, but you know what they say about people who are into small steins. We ordered a Jumbo Complete (Giant pretzel served with “Obazter” Cheese, Sweet Mustard, and Onion Mustard) as a starter. If pretzels are your thing, then you’ll dig this. I thought the Onion Mustard was on the amazing side. 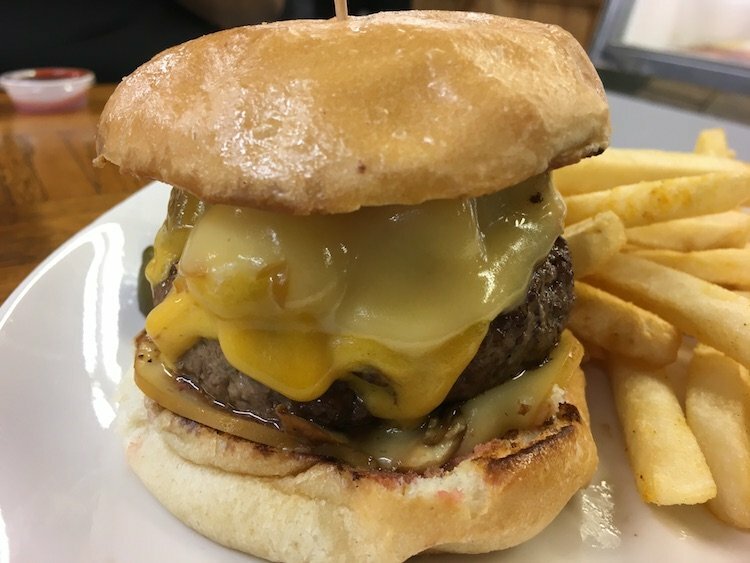 As for an entrée, I ordered the Riesen Fleischpflanzer (Giant Bavarian Style Hamburger made with Pork and Beef) on a Kaiser Roll and topped with Swiss Cheese. Well, I’ll say it was a pound. It was gigantic and it was definitely a homemade bun. I loved it and thought it was a nice change of pace from the usual 80/20 mix or sirloin that most places serve plus Swiss happens to be my favorite cheeses. It was a nice touch. If you’re into German music, there are live German bands performing German drinking songs in suspenders and shorts (If you saw Beerfest, you’ll know what I’m talking about). And…..if you’re feeling competitive, there’s a Stein Holding Contest every Friday and Saturday. The participants must hold a 1-liter stein filled with beer (approx. 3 pounds) parallel with their shoulder blades for as long as possible to take home an “official” Hofbräuhaus 1 Liter stein. Now that’s what I’m talking about! There is Hofbräuhaus located in Miami in case Vegas is out of the question for you.